We're springing into summer with a vibrantly colored flying friend — the adorable Royal Peachick! 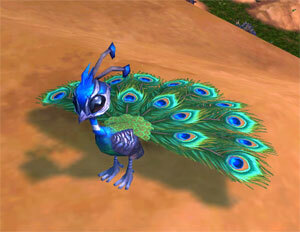 The Royal Peachick can be collected by completing the achievement Draenor Safari. This achievement is pretty straight forward, and collectors with a decent stable of level 25 battle pets should have no problem capturing the pets on the list. There is a total of 25 wild pets that must be captured from zones in Draenor. The majority are plentiful and can be easily found wandering around. A few will only spawn in a small area within the zone (Shadow Sporebat in Talador, is one example), or nearby their larger counterparts (Leatherhide Runts are usually near clefthoof mobs in Nagrand). All wild pets in Draenor are level 25. The achievement doesn't require a specific pet quality, so if you're in a rush to complete it, capture the first of each unique Draenor battle pet that you come across. You can always use a battlestone to upgrade them later, but keep in mind that many of these come in multiple breeds. The Royal Peachick is a gorgeous little bundle of feathers, and it has cousins! Three other baby peacock pets exist, two of which you'll end up collecting on your journey to the Royal Peachick: Brilliant Bloodfeather, Everbloom Peachick, and Golden Dawnfeather. The Royal Peachick is a colorful little fighter with some versatility to offer. The combo of its natural speed from being a Flying pet, plus the combo of a group speed boost from Dazzling Dance and a Feign Death swap means the Peachick can offer its utility from the back row. Feign Death is a super powerful move for avoidance as well. Dazzling Dance also provides some good self-synergy for Quills, which hits an additional time if the pet using it attacks first. The other DPS option is Savage Talon, which will provide additional DPS throughput without that extra speed hit from Quills. Talon will also be a better pick against multi-hit counters like Shell Shield. Arcane Storm, an anti-root weather effect isn't powerful by itself, though the ability to change the weather at all comes with a lot of value. One of the best abilities the Peachick has is Rain Dance, which will heal the Peachick and boost your team's hit chance by 50%. This makes for a great combo with abilities with less chance to hit. Nocturnal Strike will always hit when comboed with Rain Dance, for instance, but 2 turns is a very small window with no chance for error. There are a few pets you can try in a pinch for substitutions, if you still need to round out your stable before you can nab your Peachick. If you're looking for a pet which can feign death, Egbert is an easy pickup for the spring season. Rain Dance is also used — perhaps better — by the Junglebeak, an easy tame in Gorgrond you'll already have from the Safari achievement before you get the peachick. This is really the Peachick's one real weakness. It's a solid little pet on its own, but because you have to tame so many high-value pets to get it, those pets generally have better tricks up their sleeve. Pet of the Month is co-written by Liopleurodon, an experienced pet battler and long-time WoW player. She maintains her own Pet Battle blog and is a Pet Battle and esports columnist on the fansite Blizzard Watch.